CHICAGO (Reuters) - Illinois' pile of unpaid bills is on track to top $8.5 billion by year-end as payments mandated by state law or courts in the absence of an enacted budget exceed available revenue, the state comptroller said on Wednesday. The bill backlog, a barometer of Illinois' structural budget imbalance, had dropped to about $4 billion in July from around $8 billion in January, according to the comptroller's office. 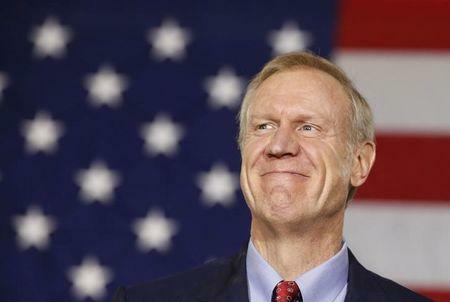 It rose to $5.5 billion in August and is projected to keep climbing if a budget impasse between Republican Governor Bruce Rauner and Democrats who control the legislature continues. The stalemate is over the budget for fiscal 2016, which began on July 1. Comptroller Leslie Munger, who heads the office that pays Illinois' bills, told reporters that her staff is "performing triage" every day to accommodate more than a dozen court orders and consent decrees to pay for social services, Medicaid and payroll based on fiscal 2015 funding levels, as well as continuing appropriations that cover pensions, debt service on state bonds and other matters. At the same time, fiscal 2016 revenue is projected to fall by nearly 18 percent from fiscal 2015 due mainly to the rollback of temporary higher income tax rates on Jan. 1, according to Munger. "This is clearly a recipe for disaster and the longer this continues, the harder it will be for our state to regain its fiscal footing," she said. Illinois has the worst-funded pensions and the lowest credit ratings among the 50 states. Moody's Investors Service warned last month that Illinois risks turning a projected deficit of about $5 billion into an actual deficit if there is no budget in place by the end of September. Munger said her projections do not include colleges and universities, state employee and retiree health insurance, lottery winnings and other items that are not being funded because they are not covered by court orders or continuing appropriations.